DPS for each pet was tested at the Special Forces Training Area of the Lion’s Arch Aerodome. Pets were ordered to attack various Target Golems (Standard, Condition Immune and Mobile) and their DPS numbers were recorded. During testing pets attacked by themselves and received no additional support from the player. Player specializations and traits were selected to maximize pet DPS. F2 skills that do not inflict damage were not tested. In these scenarios the damage numbers from the auto attack test were recorded. The Hyena is a special case because it has different (fewer) attributes than other canine pets. This is why Hyena is displayed separately. Note: Base DPS was measured using a Condition Immune Target Golem so that pet condition effects would not contribute toward the damage total. Note: Stationary DPS was tested on a Standard Target Golem with condition damage active. Mobile DPS was tested using a Mobile Target Golem that moves in a circle with the the Ranger Pet positioned in the middle. Note: F2 skill damage was tested by activating the pets’ F2 skill as soon as it was off of cooldown. Note: Tigers have higher non-condition DPS, but Lynx have higher total DPS. The feline family provides the highest DPS of any Ranger pets. This is due to their high level precision and condition damage attributes, combined with powerful F2 skills. The Lynx, specifically, is the highest DPS pet thanks to its “Rending Pounce” F2 skill which inflicts 4 stacks of bleeding for 10 seconds. Bristlebacks offer the highest ranged DPS, while also providing decent damage against moving targets. Hyenas are the lowest DPS Ranger pet. Although they are part of the “canine” family, Hyenas have 50% less power than other canines, giving Hyenas the lowest total attribute count of any pet. 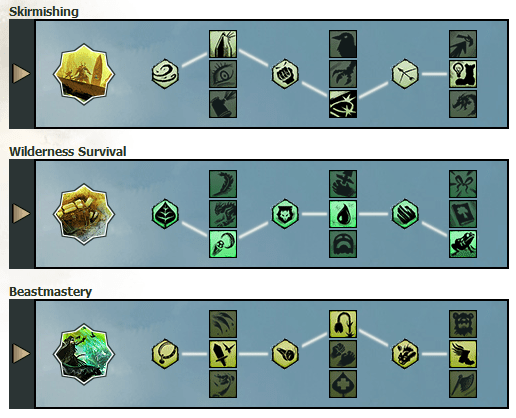 This is supposed to be balanced by the fact that Hyenas have a unique F2 skill that allows them to summon another Hyena to attack. But in practice, it’s not enough to compensate for their severe lack of power.